Danum Valley is the finest birding location I have ever been to. I typed the above sentence and then dared myself to defend it. It’s a strong sentence, and one I’ll struggle to justify with my poor grasp of English and reputation towards hyperbole. There are, certainly, places I’ve enjoyed more. And places I have seen more birds. But a a package, if I had to rate the best places I’ve ever been birding, the only place I can think that comes close is Mweya, in Uganda, or maybe Tikal, in Guatemala. 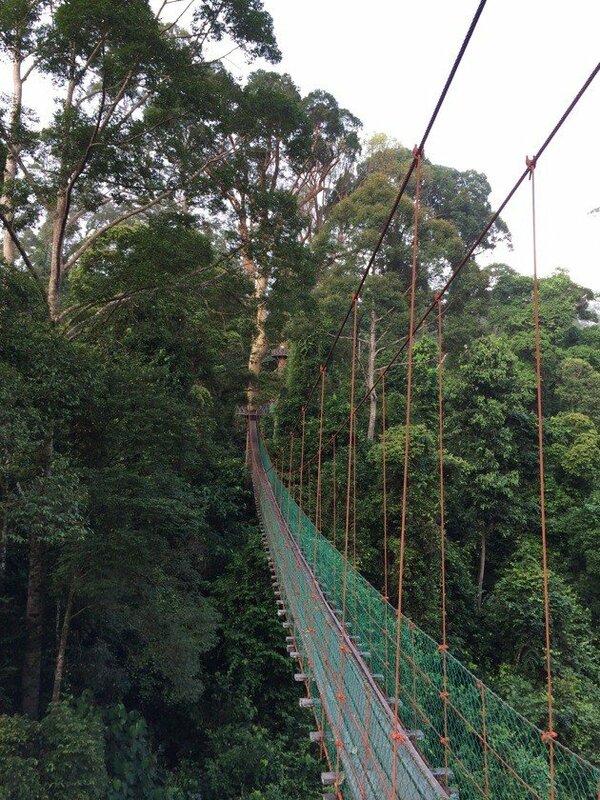 Danum Valley is a conservancy that protects a large area of lowland rainforest in Sabah in northeastern Borneo. That’s a threatened habitat, and one much sought after by wildlife enthusiasts. I’ve sketched out before the highlights (that I have done) of Sabah, and Danum is the largest and most intact area of lowland rather than montane forest on the tourist route. Given the range of lowland specialities on offer, including a number of endemics, it’s a draw for birders. But access isn’t easy, you can only really see it through two locations, a scientific field station that does take some serious birders, or the expensive but luxurious Borneo Rainforest Lodge. I argued, in my earlier piece, that if you couldn’t go to the lodge, and it is expensive, then take Sabah off your list until you can. I was called out about that in my comments, with someone saying the field centre was fine. I disagree, even though I haven’t seen the centre, but I’ll address that point at the end of this article. 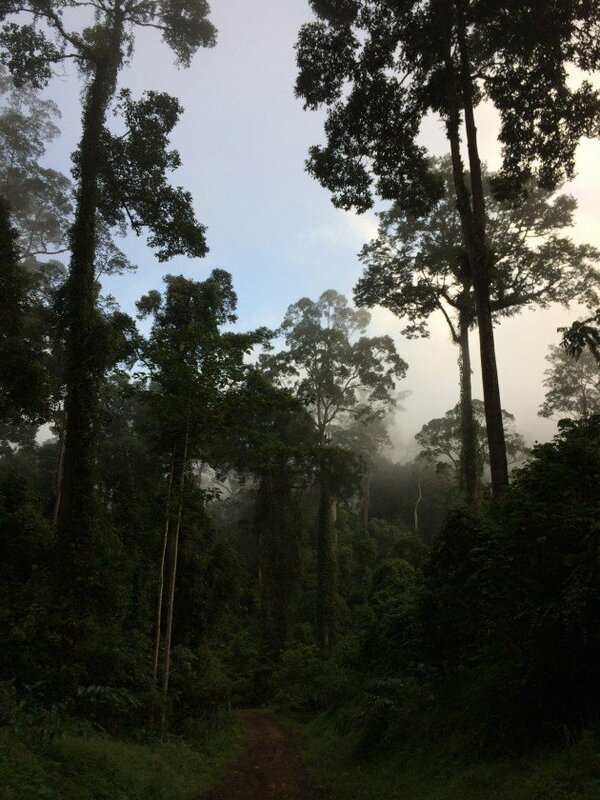 We (you may recall I was travelling with my parents and brother in Borneo) hit Danum Valley at the end of our trip. We arrived at the rather untouristy seasite town of Lahad Datu where our guide dropped us off at the office of the lodge. It was here that the comfort began. 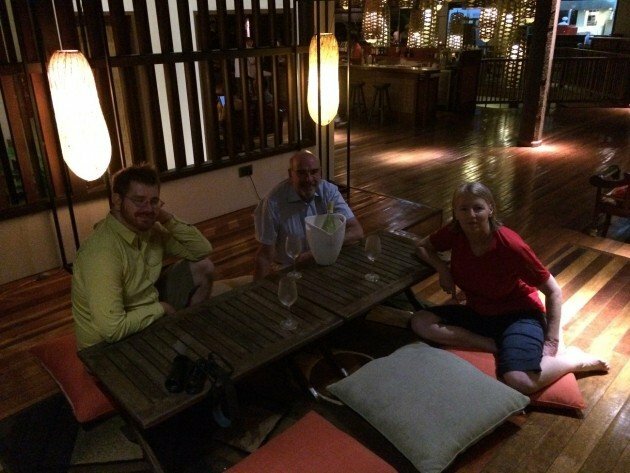 Rather than the usual dismal waiting area there were comfortable seats and drinks, and when our transports arrived, we were placed in two large four wheel drives rather than one, so that we wouldn’t feel cramped. The drive into the forest took a while, but was very comfortable, given that it was on dirt roads deep in the jungle. The road was better than many main roads I’ve travelled on in my life! Arriving at the lodge you are swept up by the staff who usher you to some comfortable chairs were you are supplied with tasty drinks and have the place explained to you. You also get to meet your guide, who is assigned to you for the duration of your stay. We’d stipulated that we wanted a bird guide, which we got, but like other guides we had in Borneo he knew a lot about lots of natural history. 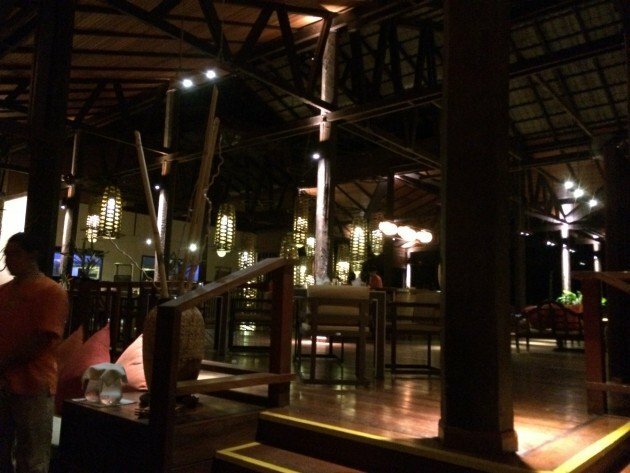 We were then shown to our luxurious river-side chalets. They were very comfortable, especially as they had been designed to stay cool without air conditioning. One cool feature was the bathtub on the (private) deck overlooking the river. I’ll admit that, on the first day, the birds didn’t impress. 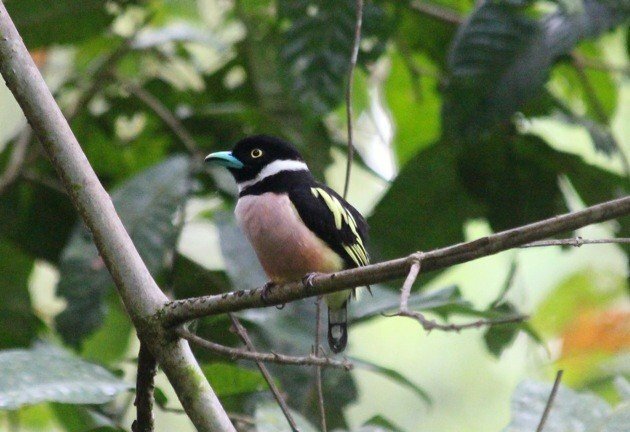 There wasn’t much around, and aside from a lifer Yellow-bellied Bulbul the two most impressive species were heard not seen – a Blue-headed Pitta an a Banded Kingfisher. An oversubscribed night drive didn’t help. The cool stuff seen, principally a Colugo (a flying lemur as it is sometimes known) and the odd Bearded Pig, were somewhat spoiled by the feeling that too many people were scaring away other cool stuff. This is the place, after all, that people see Sunda Clouded Leopards! That feeling that the place couldn’t meet my expectations was on my mind as we met our guide again at dawn. But as we walked down the road towards the canopy walkway, we heard a lot of birds and started seeing more and more, like Plain Sunbirds, Little Spiderhunters (also a type of sunbird) and Dark-sided Flycatchers. One really nice find just before the walkway was a Raffles Malkoha, a type of large (albeit small for the genus) forest cuckoo that was also a lifer. But it was on the canopy walkway that things really began to pick up. 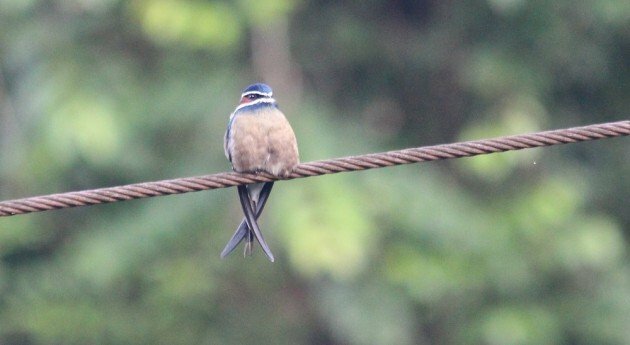 First off, making use of the wires as a perch, was an adorable Whiskered Treeswift. Then we flushed a hidden Diard’s Trogon, a flash of grey and crimson as it took off. Some of the birds were astonishingly confiding, including a Rufous -capped Babbler foraging for insects, a tiny Rufous Piculet ( a diminutive type of woodpecker) and a very bold Black-and-yellow Broadbill. Two highlights of the walk back were a bright green Greater Green Leafbird and a Lesser Fish Eagle following the road above our heads. After a sumptuous breakfast (albeit one without pork products) we set out on another walk, this time up a hill overlooking the camp. Almost as soon as we left the grounds we came a cross a feeding flock of Pygmy Ibon, a minute type of white-eye (already a small family), and then a handful of bizarre looking Dusky Broadbills (they look like they are manically grinning) perched over a river. As we climbed the hill we encountered a flock of Chestnut-rumped Babblers and numerous Brown Fulvettas. 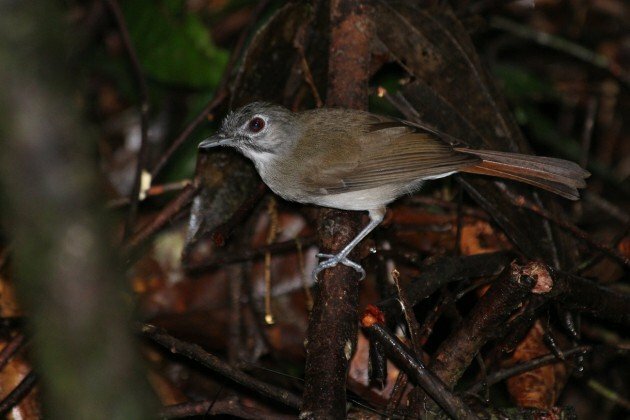 Fulvettas are also babblers, and the family, or families, are very well represented here – we also heard Short-tailed Babblers and Chestnut-backed Scimitar-babblers. From the viewpoint we were able to look out over the forest and the camp, but also look directly down on a resting Orangutan! On the way down we were able to look at tribal graves in the cliff and rest in a pool under a waterfall – one with small fish that groom swimmers (your mileage may vary!). The afternoon was spent sheltering on our deck as the rains came down and down, after which the birding was not so good (it seems to be a lot better in the morning). The highlight again happened before we left the camp, a family of Crested Firebacks. 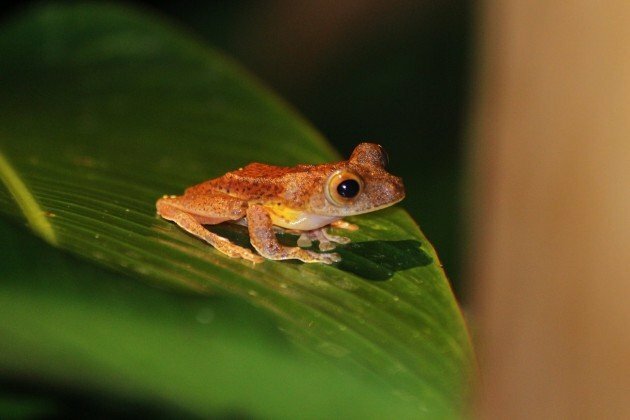 We did see more mammals though, including a Greater Mousedeer (exactly what it sounds like), a Maroon Langur, and in the night walk a stunning Banded Palm Civet (and flying frogs!). 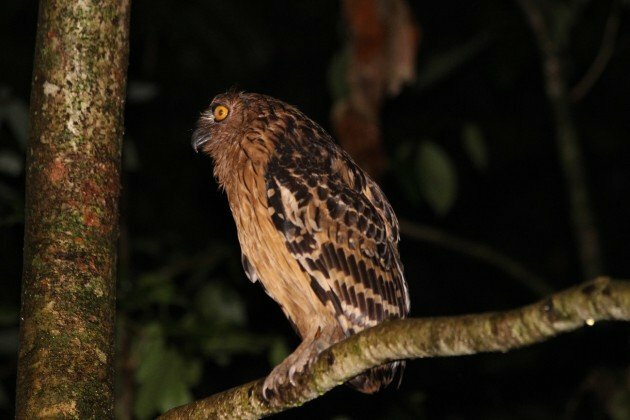 Oh, there were Buffy Fish-owls. Did I mention them? Our last morning, New Year’s Day, followed the pattern of the previous day; although arguably it had even better birds, including Chestnut-winged Babblers, and actually seen Banded Kingfisher and the very peculiar Bornean Crested Jay, a bird I dimly recall has recently been placed in a new family after a long time of taxonomic uncertainty. 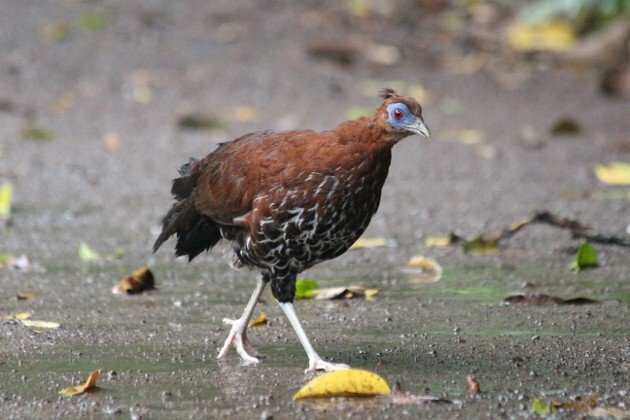 I also managed to get my eyes on the magnificent Great Argus, a massive forest pheasant (or peacock even), and the Chestnut-necklaced Partridge (am I the only one noticing the number of birds with chestnut in the name, I haven’t even mentioned the Chestnut-bellied Malkoha?). Calling loudly overhead were Bornean Black Magpie and Rhinoceros Hornbills, and, at the last moment, we heard Blue-headed Pitta again. We froze, then dashed over to the forest edge. The guide told me that it was gone, but I lingered, and then saw something moving, and got my bins on it. At first I thought I’d seen an orange thrush, but no, it was the female. A pitta! And all this before breakfast. 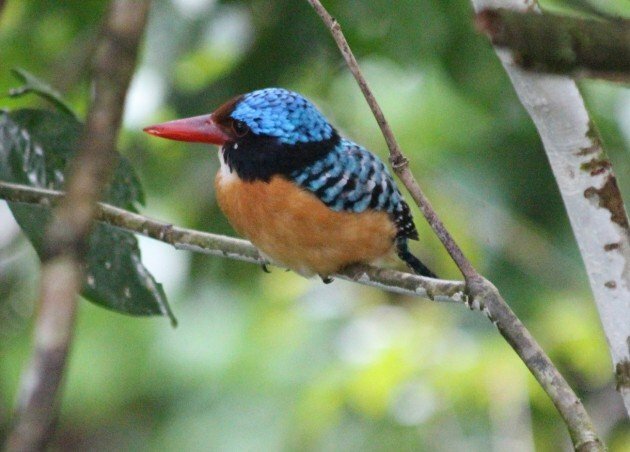 A canopy-loving Banded Kingfisher, in the canopy. Another babbbler! Moustached Babbler this time. These are just dip-in highlights. The location has so much to offer, and I only saw a fraction of it. But its more than just birds, it’s a fantastic and relaxing forest retreat, where the food is incredible, the service first rate. My parents, neither of whom are birders, declared on the second night that they wanted to return to this location and spend more time. 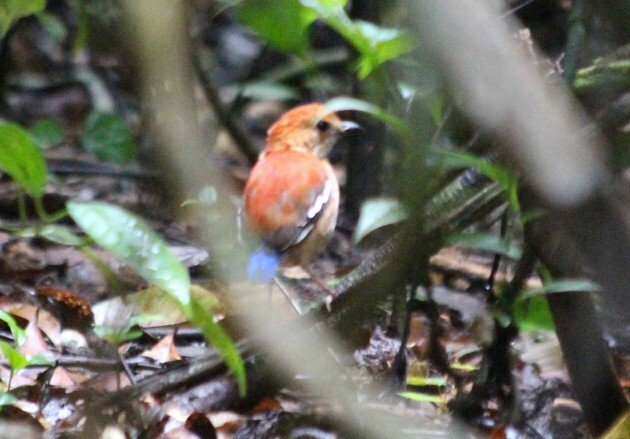 Blue-headed Pitta – my bird of the year last year. So, I repeat, come here and not the Danum Valley Field Centre. If you can’t afford here, hold off coming to Borneo till you can. There are plenty of places you can get lots of birds cheaply, on a shoe string. But I believe birding should be more than just “getting birds”. 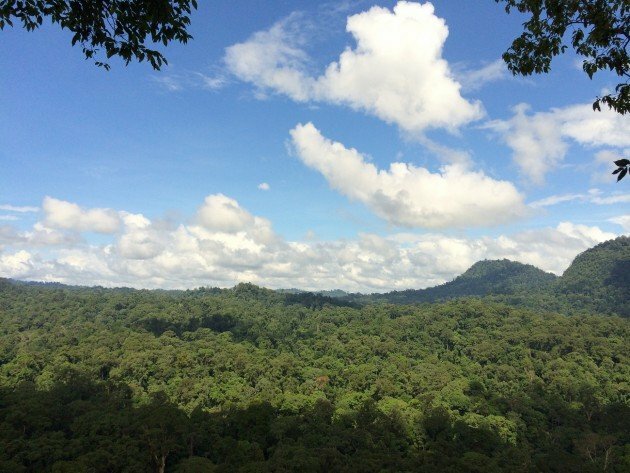 Danum Valley is an experience, and I can’t recommend it enough. A tick is a tick. This is a place to savour with loved ones. And wine.